THIS MAN JUST WANTED TO DO SOMETHING NICE FOR HIS DAUGHTER. BUT WHAT HAPPENED NEXT ALMOST GAVE HIM A HEART ATTACK. Last night my wife was playing tennis and it was just my daughter and myself at home. 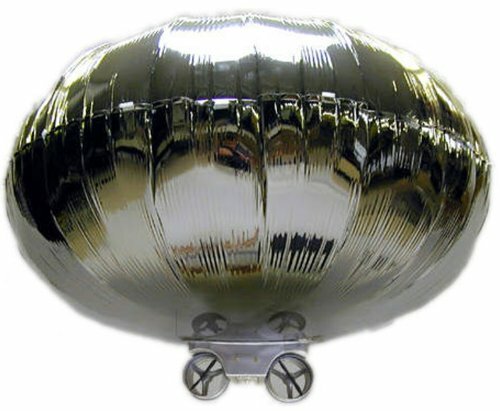 I bought a small helium tank from a party store, and we put a blimp together. And so began the most unexpectedly terrifying evening of my life. Let me tell you, it’s quite a blimp. It’s huge. The balloon has like a 3 ft. diameter. We blew it up with the tank, attached the gondola with the propellers, and put in batteries. Then we balanced the blimp for neutral buoyancy with this putty that came with it, so it hangs in the air by itself neither rising nor falling. Let’s face it, blimps are fun. Alas, the fun had to end and my daughter had to go to sleep. I left the blimp floating in my office downstairs. My wife came home, and we went to bed, and slept the sleep of the righteous. At this point it is important to note that my house has central heating. I have it configured to blow hot air out on the ground floor and take it in at the second floor to take advantage of the fact that heat rises. 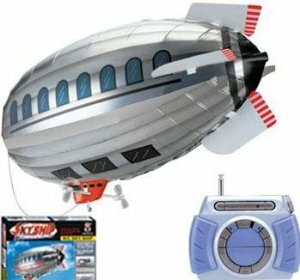 The blimp, which was up until this moment a fun toy, here embarked on a career of evil. Using the artificial convection of my central heating, the blimp stealthily departed my office. It moved silently through the living room and drifted to the staircase. Gliding wraith-like over the staircase, it then entered the bedroom where my wife and I lay sleeping peacefully. Running silently, and gliding six feet or so above the ground on invisible and tiny air currents it approached the bed. In spite of it’s noiseless passage, or perhaps because of it, I awoke. That doesn’t really say it properly. Let me try again. On this occasion I awoke to the sense that there was a large menacing presence approaching me silently out of the gloom, so I opened my eyes, and there it was! A LARGE SILENT MENACING PRESENCE WAS APPROACHING ME OUT OF THE GLOOM, AND IT COULD FLY!!! Somewhere, in the control room of my mind, a fat little dwarf, in a security outfit, was paging through a Penthouse while smoking a cigar, with his feet up on the table watching the security monitors of my brain with his peripheral vision. Suddenly he saw the LARGE SILENT SINISTER MENACING FLOATING PRESENCE coming at me, and he pulled every panic switch and hit every alarm that my body has. A full decade’s allotment of adrenaline was dumped into my bloodstream all at once. My metabolism went from “restful sleep mode” to “HOLY SH*T! FIGHT FOR YOUR LIFE OR DIE!!!! mode” in a nanosecond. My heart went from twenty something beats per minute to about 240 even faster. I always knew this was going to happen. I always knew that skepticism and science were mere psychological decorations and vanities. Deep in our alligator brains we all know that the world is just chock full of evil and monsters and sinister forces aligned against us,, and it is only a matter of time until they show up. Evolution knows this, too. It knows what to do when the silent terror comes at you from out of the dark. Without volition I screamed my battle cry (which is indistinguishable to the sound a little girl makes when you drop a spider down her dress — not that I’d know what that sounds like), and leaped out of bed in my underwear. 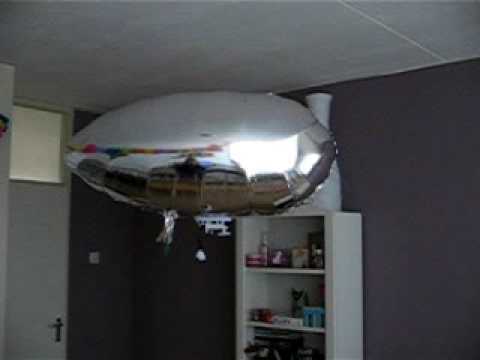 I struck the approaching menace with all my strength, and almost fell over at the total lack of resistance that a helium balloon offers when you punch the living sh*t out of it ,with all the strength that sudden middle of the night terror produces. It’s trajectory took it straight into the ceiling fan which whipped it about the room at terrifying velocity. Seeking a weapon, I ripped the alarm clock out of its plug and hurled it at the now High Velocity Menacing presence (breaking the clock and putting a nice hole in the wall). Somehow at this moment I suddenly realized that I was fighting the blimp, and not a monster. It might have been funny if I didn’t truly and actually feel like I was having a legitimate heart-attack. On quivering legs I went to the bathroom and literally gagged into the toilet while shaking uncontrollably with the shock of the reaction I’d had. Unbelievably, both my wife and daughter had completely slept through the incident. When I decided that I wasn’t having a heart attack after all, I went back into the bedroom and found the blimp, which had somehow survived the incident. I took it to the walk-in closet and released it inside, where it floated around with the air currents released from the vents in there. I closed the door, thus sealing it in, and went back to bed. At about 7 AM my wife awoke. She had been playing tennis and wasn’t aware that we had assembled the blimp the previous evening, and that it was now floating around the walk-in closet that she approached. The dynamic between the existing air currents of the closet and the suction caused by opening the door was just enough to give the blimp the appearance of an Evil Sinister Menace flying straight towards her. RULES for Dating MY Daughter!